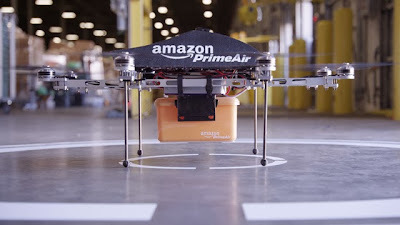 It does not seem to be the start of April, so I guess Amazon must be serious when they claim to be exploring the possibility of having their products delivered by unmanned drones. This creates the attractive possibility of having the latest best-seller precision-dropped through the panes of your cold frame, or your beloved dog cut to shreds by an Octocopter as it descends onto your lawn. But it’s progress, isn’t it? And surely exactly what the City’s teenage scribblers had in mind when they trashed Greggs’ share price during the dotcom boom of the late 1990s, on the grounds that the whole idea of a “shop” was dead. They will surely have the last laugh as miniature helicopters fly through our office windows bearing sausage rolls and cups of coffee. 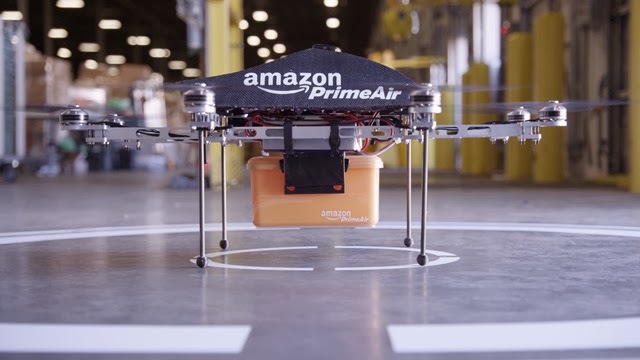 Even if the Air Traffic Control implications seem more than a little disturbing. 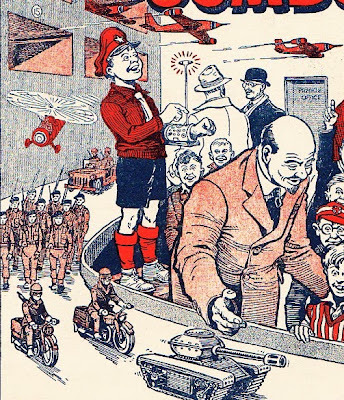 This was the future as predicted in the pages of my favourite childhood comic, in which a lucky boy called General Jumbo had a vast miniature air force, army and navy at his command. I always related to him, not so much because I had a particular interest in model armed forces, but because I shared his tendency to stoutness. Who would have expected The Beano to turn out to be a more reliable predictor of the future than Tomorrow’s World? If the futurologists of the 1970s were to be believed, by now we would be working no more than 20 hours a week, retiring at 50, enjoying limitless free nuclear power and subsisting on vitamin pills. None of which seems likely to come to pass apart from not working very long, as pretty much every job in the country is outsourced to India. Still, not to worry. “Dave” Cameron and an assortment of his family and friends are out in China as I type, opening up a new golden age of export-led growth. 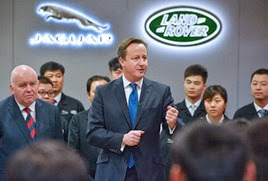 Though his decision to put Jaguar Land Rover at the forefront of promoting UK plc does make me wonder whether he is not secretly in league with the Dalai Lama to bring the Chinese weeping to their knees, if personal experience of my hugely expensive and totally unreliable Land Rover Discovery is anything to go by. Sorry. I should have put a warning at the top of this column for my new Wednesday audience. (Which, research tells me, is larger, richer and more business-orientated than the bunch of dullards who pick up the paper on Tuesdays.) This is the weekly update from the bloke who hates “progress” in all its manifestations, from Ed Miliband to trendy church services by way of wind farms. A fine example occurred last week when I received a letter from my four-year-old son Charlie’s school informing me that he would no longer be required to wear a shirt and tie. Even though the pleasingly reactionary dress code had been pretty decisive in my choice of school in the first place. Even worse was the reason for the change. The pupils had requested it at the “school council”. The oldest of them is 11, for heaven’s sake. If you consult them you will end up with whole classes in Spiderman costumes and school lunches supplied entirely by Cadbury’s. It’s the daftest thing I have heard since Alex Salmond extended the vote to 16-year-olds as part of his attempts to rig the Scottish independence referendum, with the hugely pleasing outcome that their teenage contrarian instincts apparently make them one of the groups likeliest to vote “No”. Where will it all end? 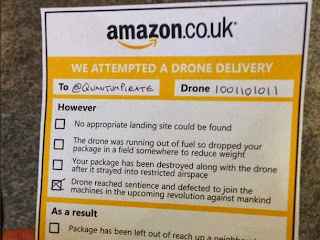 In five years’ time I expect that Charlie (aged nine) will be voting in a referendum on Northumbrian independence, all our high streets will be boarded-up and filled with tumbleweed, and the news websites will be dominated by heartbreaking stories of all the Christmas presents destroyed as “Cyber Monday” segued seamlessly into “Drone Crash Tuesday”. Of course it’s never going to happen. At least not until they have perfected an Octocopter guaranteed to flutter down in the five minutes you have chosen to nip to the loo. 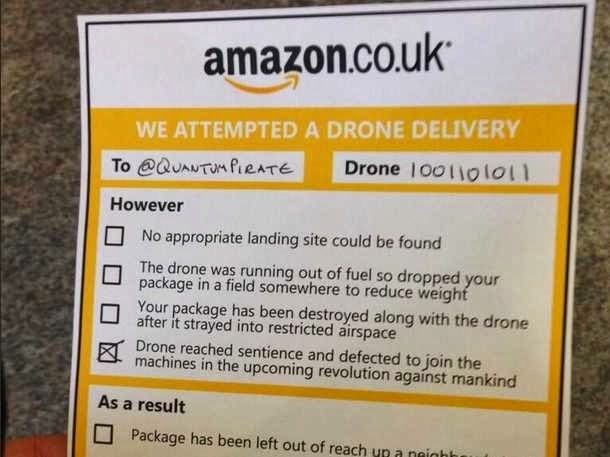 And trained it to write a “Sorry You Were Out” card and leave it wherever you are least likely to find it.